The rocket's “primary booster” and “orientation thrusters” are powered with compressed air. The booster is a paint shaker bolted below the cabin; the long springy legs let the oscillating motion transfer to the cabin itself. Three thrusters are mounted radially around the bottom of the cabin; they point down and back towards the center of the rocket, for visibility through the expanded-steel floor. Each is independently actuated by an electric solenoid. The solenoid circuit also powers an LED flashlight that illuminates the spray, making a really impressive effect at night: An air compressor in the basement of the house supplies the power. Its quick-disconnect hose snaps onto a copper pipe passing through the exterior wall, then down into a trench across the back yard. It emerges from the ground, passes up along a rocket leg, and enters the distribution manifold. a wire-pulling twine just in case we decide to squeeze another signal in there. Jeremy points out that this is more utilities than serve his condominium. 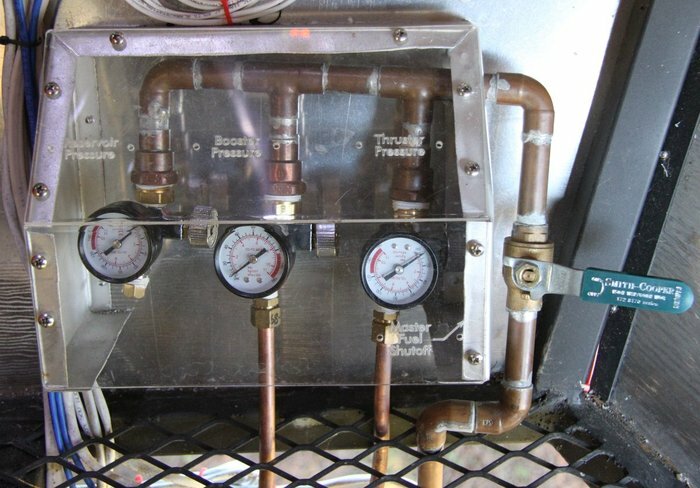 Inside the rocket, the air passes through a main shutoff valve, and is distributed through a manifold to three regulators with gauges. The leftmost regulator's output is closed, so that its gauge always reads supply pressure. The other two regulators supply air to the thruster air circuit and booster air circuit. 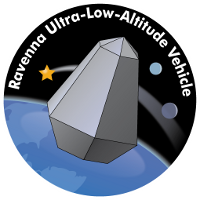 A related system delivers fresh water into the rocket from the household supply to refill the thruster reservoir. A remotely-operated solenoid at the water spigot admits water pressure into the trenched tube when a button is pressed inside the rocket. When the water arrives at the rocket, it fills a 1 gallon reservoir. The reservoir has an overflow hole, so that it never contains positive pressure. Vinyl tubes dip the reservoir; when a thruster is actuated, Bernoulli-effect vacuum draws water to the thruster to spray. 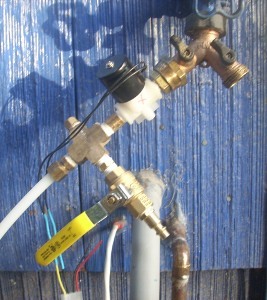 The water line has a quick-disconnect fitting and valve. When the weather is forecast freezing, it takes about five minutes to clear the water line with compressed air.